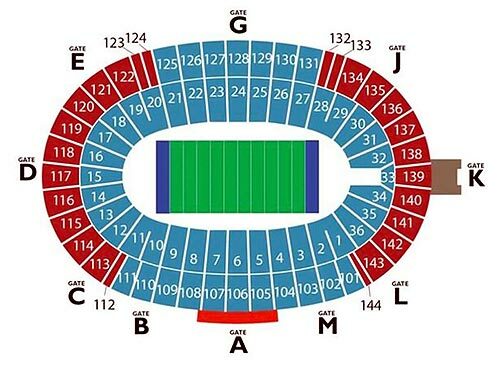 Provided below is the new seating chart for 2009 Cotton Bowl game. As you may know, the Cotton Bowl is undergoing renovations due to the aging of the facility. Southern Bleacher Company, the winning construction bidder, is adding seats, concession stands, scoreboards, restrooms and lighting and sound upgrades. We can also expect additions of media, conference and VIP sections. The overall plan is set to cost $50 million, and should be finished before the Texas – OU game. The new stadium will have a maximum capacity of over 96,000. Make sure to get yor UT-OU tickets, and your Cotton Bowl game tickets here at TicketCity. We offer the best college football experience with the largest supply of college football tickets, including Texas Longhorns Tickets and Oklahoma Sooners Tickets.